For a similar garment worn in India and elsewhere, see Lungi. A longyi (Burmese: လုံချည်; MLCTS: lum hkyany; pronounced [lòʊɴdʑì]) is a sheet of cloth widely worn in Burma. It is approximately 2 metres (6.6 ft) long and 80 centimetres (2.6 ft) wide. The cloth is often sewn into a cylindrical shape. It is worn around the waist, running to the feet. It is held in place by folding fabric over without a knot. It is sometimes folded up to the knee for comfort. Similar garments are found in India, Bangladesh, Sri Lanka, and the Malay Archipelago. In the Indian subcontinent it is known variously as a lungi, longi, kaili or saaram. Men who cannot read are like the blind; women who cannot weave are like the cripple. Burmese watercolour from the 19th century. A woman weaves a paso on a loom while a man, wearing a paso, looks on. A woman dressed in the old htamein style prevalent until the 1900s. The modern longyi, a single piece of cylindrical cloth, is a relatively recent introduction to Burma, having gained popularity during British colonial rule, effectively replacing the paso and htamein of precolonial times. 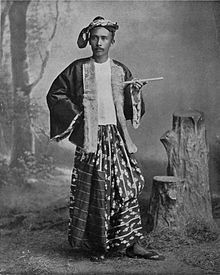 The word longyi formerly referred to the sarong worn by Malay men. In precolonial times, men's pasos used to be a long piece of 30 feet (9.1 m) called taungshay paso (တောင်ရှည်ပုဆိုး) and unsewn. Alternately the htamein was a 4.5 feet (1.4 m) long piece of cloth open at the front to reveal the calves, with a dark strip of cotton or velvet sewn on the upper edge, a patterned sheet of cloth in the middle and a strip of red or white cloth sewn below, trailing on the bottom like a short train. Paso was commonly worn by men in 19th century Burma and Thailand. The amount of cloth in the putso was a sign of social status. "Nearly all the men are naked to the waist, or wear a small white open linen jacket, with a volumnious putso [paso] wound tightly round their loins and gathered into a great bundle or knot in front." "The putso piece is usually from nine to ten yards long. When made up for use the length of web is cut in halves, which are stitched together so as to give double width. It is girt round the waist without any fastening." However, with the onset of colonial rule, Lower Burma and urban areas more readily adopted the longyi worn in the Malay and Indian style, which was considered more convenient to wear. 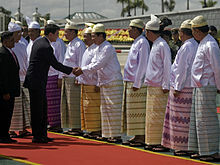 In an October 2010 state visit, Burmese State Peace and Development Council members greeted Thai PM Abhisit Vejjajiva in acheik patterned longyi typically worn by women. Various sources attributed this to yadaya practices. In Burma, longyis worn by males are called paso (ပုဆိုး), while those worn by females are called htamein (ထဘီ, or htamain). Strictly speaking, they are not unisex attire, as the way they are worn as well as the patterns and makeup are different between the sexes. Men wear the modern paso by making a fold on either side in front and tied by tucking them together at the waist just below the navel. Women, on the other hand, always have a 3 cubit 1 finger span length but again unsewn in the old days like men's. They are worn wrapped around with a single broad fold in front and the end tucked in on one side or folding back at the hip and tucking into the opposite side of the waist, usually topped with a fitted blouse worn just to the waistband. Hemlines rise and fall as the fashion of the day dictates although they are unlikely to go up above the knee. Longyis are generally sold unsewn but nowadays they are available ready to wear; htameins may even be sewn like Western skirts. Untying and re-tying a longyi is often seen in public with both sexes, women much more discreetly than men. Men's pasos are generally stripes or checks apart from plain colours and may be worn upside down or inside out with no difference. Women's htamein has a black calico band called a htet sint (အထက်ဆင့်, lit. topband) for the waist; they wear more multicoloured and floral patterns, too. Cotton is the basic material but all sorts of fabrics, both imported and home-grown, may be made into longyis. Tootal, georgette, satin and crepe have been made into htameins. Indonesian batik, although very expensive, has been very popular for decades; outfits of batik (ပါတိတ်) of the same design top and bottom were very popular in the 1980s. For ceremonial and special occasions wearers use their best silks; the most elaborate ones are known as a cheik (အချိတ်, lit. hook), a beautiful and intricate wave or houndstooth pattern in several colour combinations from the weavers of Amarapura. They are worn especially at weddings, almost invariably by the bride and groom in matching colours. The poor may keep aside some traditional silks for special occasions. In ancient times silks were generally worn by royalty and courtiers, the royal pasos and htameins richly embroidered with gold, silver, pearls and precious stones. Modern reproductions of these may be seen on the stage at zat pwès (theatrical performances). Ethnic and regional weaves and patterns are plenty and popular. There are Rakhine longyi, Mon longyi, Kachin longyi, Inle longyi, Zin Mè (Chiang Mai) longyi, Yaw longyi, Seik Hkun longyi, Dawei longyi and more. Silk pasos, but not a cheik, that men wear for special occasions are called bangauk (Bangkok) paso. Kala (Indian) paso are often longer and are worn by taller people; Kaka zin refers to a broad check pattern of black, brown and white worn by Indian teashop owners. Mercerised longyis from India are popular as the fabric is more durable. The longyi suits the climate as it allows some air to circulate and keeps cool in the hot sun. Silks are unique in keeping warm in the winter as well as cool in the summer. The longyi is versatile. Men often tuck the lower portions of their pasos at the top by bunching it in the front then passing it up between the legs round the back to the waist, known as paso hkadaung kyaik and, rather like the dhoti, usually for climbing and sporting activities instead of changing into shorts or trousers. Soldiers in ancient times wore their pasos in this manner either on their own or on top of a pair of trousers. In rural areas men are often seen with a folded paso on one shoulder either for use when bathing (yei lè — lit. water change — longyi) or for use as a cushion for a carrying pole on the shoulder or a heavy load on the back. Women, when they bathe, simply wear their htamein higher by tucking it just under the arms to cover their breasts before removing the blouse; they may be seen using the htamein as a buoy in the river by trapping some air in and secured underneath by the hands. They use a man's paso or another piece of long fabric, rolled and coiled as a cushion on top of their heads to carry water pots, firewood, baskets and trays; it is the street hawker's customary way of carrying her wares. Changing is done simply by stepping into the new longyi and pulling it up, at the same time loosening and dropping the old one, or the new one can be pulled over from the head down. However, even when in private, women change without removing all their clothes. Instead, they will wear one htaimin while changing into a new one. A woman may be seen pulling her htamein up bit by bit as she wades deeper and deeper into a river without getting it wet. It is merely a matter of lifting it up in the bathroom or in bed for that matter. Washing and ironing cannot be simpler as they are cylindrical pieces of cloth, easily hung, pressed, folded and stacked with a bare minimum use of wardrobe space. ^ "Traditional Folk Weaving Art of Myanmar inc. video". Archived from the original on 2007-10-06. ^ Thant Myint-U (2008). The River of Lost Footsteps: A Personal History of Burma. Macmillan. p. 182. ISBN 9780374531164. ^ Judson, Adinoram (1893). Judson's Burmese-English dictionary. Government of Burma. ^ a b Ferrars, Max; Bertha Ferrars (1900). Burma. S. Low, Marston and Company. ^ a b Imperial gazetteer of India. 10. Superintendent of Government Printing. 1908. p. 46. ^ a b c Sir Henry Yule (1858). A narrative of the mission sent by the governor-general of India to the court of Ava in 1855: with notices of the country, government, and people. Smith, Elder and co. p. 154. ^ a b Bowie, Katherine A. (February 1993). "Assessing the Early Observers: Cloth and the Fabric of Society in 19th-Century Northern Thai Kingdoms". American Ethnologist. 20 (3): 138–158. doi:10.1525/ae.1993.20.1.02a00070. JSTOR 645416. ^ Annie Brassey; Mary Anne Broome (23 December 2010). The Last Voyage, to India and Australia, in the Sunbeam. Cambridge University Press. p. 121. ISBN 978-1-108-02471-6. ^ Horn, Robert (2011-02-24). "Why Did Burma's Leader Appear on TV in Women's Clothes?". TIME. Retrieved 8 March 2011. ^ WAI MOE (2011-02-17). "Than Shwe Skirts the Issue". The Irrawaddy. Retrieved 8 March 2011. ^ "Myanmar Longyi". Archived from the original on 2006-06-23. ^ Bird, George W (1897). Wanderings in Burma. London: F J Bright & Son. p. 48. ^ "Inle longyi inc. video". Archived from the original on 2007-10-06. ^ "Yaw longyi from Gangaw inc. video". Archived from the original on 2005-03-13. ^ "Dawei longyi from Tanintharyi inc. video". Archived from the original on 2007-10-06. ^ Marshall, Andrew (2002). The Trouser People. Washington DC: Counterpoint. jacket photo,30.